LEBANON, Ohio – President Donald Trump Friday night marched out at the Warren County Fairgrounds to Lee Greenwood's "Proud to be an American" and rallied an enthusiastic crowd for the November election. He asked a favor of black voters. "I'm asking all African-American voters to honor us with their support," Trump said. "Get away from the Democrats, they’ve done nothing." Thousands were packed underneath a massive metal roof on the fairgrounds to listen to Trump. The venue’s capacity according to fairgrounds staff is 3,000. Rapper and avid Trump supporter Kanye West’s name came up multiple times during Trump’s hour-long speech. West made a highly publicized and profanity-laced visit to the Oval Office yesterday. “Kanye West, what he did yesterday was pretty amazing,” Trump said. West also got a blessing from U.S. Rep. Steve Chabot, R-Westwood. Trump came to southwest Ohio to help Chabot’s re-election effort. Chabot is locked in a bitter battle with Democratic candidate Aftab Pureval. It's one of the nation's highest-profile races. Trump brought Chabot onstage. Chabot spoke briefly, asking God to bless Trump, the people of Warren County and West. "I never thought I would say this, God Bless Kanye West," Chabot said. Trump spent the bulk of his speech campaigning for GOP candidates in Ohio. He praised Chabot as “a great friend of mine." Prior to the speech, Trump attended a fundraiser for Chabot. Chabot told The Enquirer earlier this week he didn't ask the president to come but he welcomes him. This race is about Trump just as much if not more than the candidates. 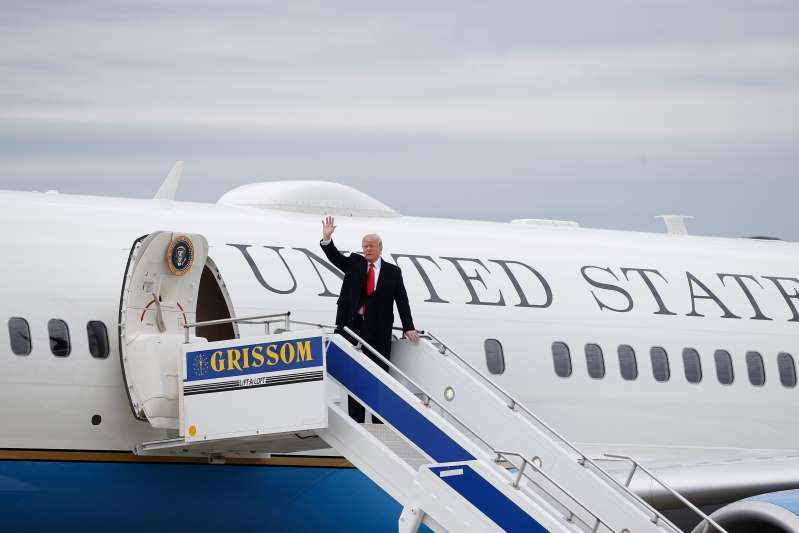 A Suffolk University/Enquirer poll released Friday showed 48 percent of Ohio likely voters said they wanted their vote "to change the direction President Trump is leading the nation." Only 34 percent said they wanted to support the direction Trump has set, though that was up from an earlier poll this summer. The candidate who received the lion’s share of attention wasn’t Chabot, but Rep. Jim Renacci, R-Wadsworth. The northern Ohio Republican is trailing by double digits in the polls against Democratic Sen. Sherrod Brown. Renacci also took the stage in the middle of the speech praising Trump. Trump thanked the newest Supreme Court Justice Brett Kavanaugh for helping Republicans this fall. "We are more energized as Republicans than ever before," Trump said. He called the Democrats an angry mob. Large crowds met Trump throughout the region on Friday. Air Force One landed at Lunken Airport as more than a hundred supporters welcomed him. The presidential motorcade caused major traffic headaches on Cincinnati's east side, particularly along Interstate 71. Supporters lined the highways. People started lining up Thursday night at the fairgrounds. Hundreds of supporters waited outside Friday afternoon with flags, signs and the ever-present red Make America Great Again hats. A breeze rustled flags with images of Trump's visage looming over the New York skyline or on a tank with fireworks exploding overhead. "Oh my God," one woman exclaimed as she saw the line. Trump's visit comes amid his tour of the country to praise the economy and help vulnerable Republicans in competitive midterm elections. The fairgrounds in Lebanon is in Ohio's 1st Congressional District held by Chabot. Tina Smith affixed a sparkling "Trump" pin to her windbreaker as she walked into the fairgrounds Friday. "That's my Trump bling," Smith said with a laugh. "I was just ecstatic when he won," said Smith, of Centerville, Ohio. "I've been watching the rallies on TV. They're so much fun." The contentious confirmation hearings for Supreme Court Justice Brett Kavanaugh was a topic of conversation in line at the rally. Smith thinks the Republicans will be more motivated to vote in response to the Kavanaugh hearings. "People are tired of the antics Democrats use to get their ways," Smith said. "It has really pumped everyone up." Chabot, while waiting for Trump at Lunken Airport, said he was disappointed Democrats were still dwelling on Kavanaugh. "That type of attitude is not good," Chabot said. Many in line felt the Democrats have treated Republicans and Trump unfairly. "I'm sick and tired of the Trump bashing," said Cheryl Deckner, of Symmes Township. "If we're called the 'deplorables,' then I have a word for them, the 'despicables.'"